Green wire is used to connect devices to a green circuit network. To form connections, entities capable of using a circuit network can be left clicked while holding the wire. This also works on electric poles, so they can be used to connect the wire over longer distances. 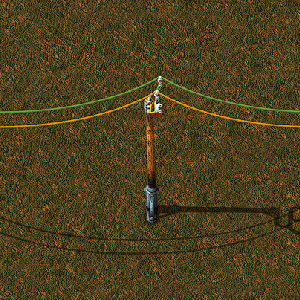 One unit of wire is needed for each connection between two points, unless a wire is included in a blueprint. Then, when the blueprint is filled out by construction robots or by hand, no wire is consumed. This page was last edited on 20 February 2019, at 20:16.